If you're looking for clever gadgets, one place to find them is at Kickstarter. Kickstarteruses "crowdsourcing" to finance all kinds of projects, many of them of the high tech variety. Most of the finance seekers at the site seek modest amounts, but some have raised a million dollars or more, and they'done it very quickly. One of those more modest projects is a clever idea by Cody and Robert Solomon of SoloMatrix. 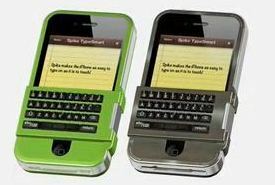 The enterprising pair have developed a folding keyboard for the iPhone 4 and 4S that's purely mechanical -- no Bluetooth, no port connector, nothing to sap power from the phone. The gadget, called the Spike TypeSmart keyboard, is part of a case for the phones. The keyboard is the same size as the phone's virtual keyboard when the device is in a vertical position. As you tap Spike's keys, they activate their virtual counterparts beneath the tactile keyboard. When a phone's full screen needs to be accessed, the keyboard can be flipped up, or as in the premium version of the product, pivoted behind the phone. The keyboard is less than a quarter-inch thick so it folds into the back of the protective case without creating a protrusion that would disrupt the sleekness of the phone, according to the Solomons. As anyone who has typed on a glass keyboard knows, it's not the best surface for the task. Most people can type faster and more accurately with a tactile keyboard, and Spike lets people do that. It even allows a user to type in their phones wearing gloves, its inventors claim. The Solomons, who have raised more than $17,000 toward their goal of $75,000, plan to launch two versions of Spike. The Spike 1, which they plan to retail for $35, has the flip-up keyboard. The Spike 2 ($60) has the keyboard with a 360-degree hinge that lets it swing out of sight behind the case. Contributors to the Solomons' cause will receive their Spikes at discount prices. If you pledge $25, you will get a Spike 1 in black or white. Shipping in the U.S. is free; to Canada, $10. A pledge of $50 will get you a Spike 2. SoloMatrix also plans to make a version of Spike for later versions of the iPhone when they are released. 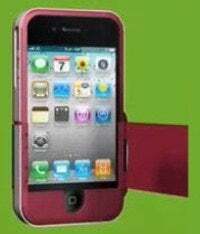 The company estimates that Spike for the iPhone 5 will be available in January 2013. While Spike TypeSmart will initially be available for only the iPhone, it's such a good idea, it's hard to imagine these kinds of keyboards not popping up for other phone models, too.